Promise. Love. Victory. It is always with those who keep their promises that we feel safest. It is always the love that requires the greatest sacrifice that is the most precious. It is always the hardest won victory that is the sweetest. This is evidenced nowhere more clearly than in the Holy Week of Jesus and, if any part of His journey from acclamation to crucifixion had been missing, we wouldn’t be here today talking about promises and love and victory. The week began with Jesus’ arrival in Jerusalem where He was met — as we read in the gospel of Mark — with great rejoicing, honor and praise. In this entry, we’ll move from the triumphal entry to the crucifixion and burial of our Lord Jesus. 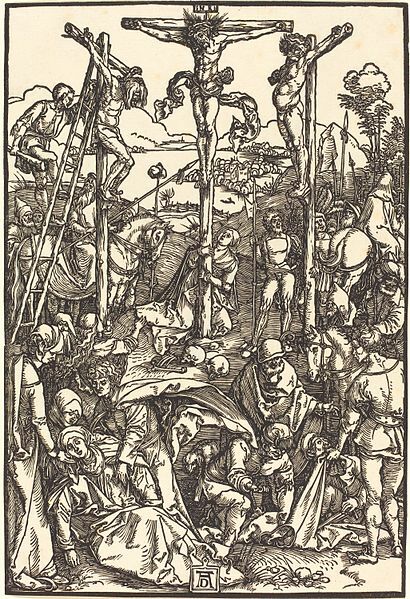 Before He went to the cross, Jesus used the image of this instrument of His death to instruct His followers in the need for being willing to bear the cross for Him, being willing to suffer and perhaps to die in obedience to Him but always with the realization that eternal glory was in store for those who would submit themselves to God. As Jesus neared the villages of Bethphage and Bethany on the eastern boundary of Jerusalem, He knew it was time for Him to be revealed as the Messiah. Messiah translates into English — the “Anointed One.” He was the One for whom the people had been waiting. But many in the crowd didn’t recognize Him because they were expecting the Savior to come in power to wipe out their enemies and to reign as an earthly king. But others knew that this Jesus – in the Hebrew “Yeshuah” (which means Savior) was the Messiah to Whom what we now know as the Old Testament pointed. And some came to understand that by coming as He did, He was defeating their enemies not just within their lifetimes but for eternity for with His crucifixion and resurrection, He won the victory over sin, death and Satan. Zechariah, prophesying more than 500 years before the coming of Christ, wrote that the Messiah would be sold for 30 pieces of silver and it was for this amount that Judas Iscariot handed over Jesus. Zechariah also predicted the money would be returned for a potters’ field, a burial place for foreigners. And it was. And all of this suffering – the prophets foretold – would be necessary so that the Messiah might take upon Himself our sins and, in so doing, accept the grievous penalty for them. The prophets also foretold that Christ’s resurrection and ascension into heaven would guarantee eternal life to all those who would believe and accept what the Savior had done for them on the cross. And this prophecy was fulfilled as Jesus asked His disciples to procure such a colt that He might enter the city not on foot, as would be expected of a pilgrim and not on a horse, as a warrior, but on a lowly donkey, as a man of peace. On the colt – and we are told in the gospel of Matthew that it was the colt of a donkey – the disciples placed cloaks to create a sort of saddle for Jesus. As a token of homage to Him, cloaks and leafy palm branches were spread on the road before Him. On Tuesday and Wednesday, He would share a number of parables, teach about the Greatest Commandment, tell about the events that would signal the end time and He would describe the final judgment. The symbolism in all of this is astonishing. In Jesus’ day, olive oil took the place of butter and cooking fat and so was crucial in a person’s diet. Oil was used as fuel for lamps. It was also used in healing. Further, in religious life, those consecrated to God’s service were anointed with oil. The prophet, the priest, the king were all anointed with oil in ceremonies of consecration. Jesus, the anointed One, gathered up into Himself the triple function of prophet, priest and king and this Messiah who fed the multitudes, who brought light into the darkness, and who healed in body, mind and spirit – this Messiah came to the Garden of Gethsemane and prepared to undo the damage done by the inhabitants of the first garden. So, just as the Bread of Life was born in Bethlehem, the House of Bread, and was placed in a feeding trough so now on the night of His betrayal, the Anointed One is found at Gethsemane, in the oil press, on the Mount of Olives. Luke 22: 44 tells us that as Jesus anguished over what was coming, His sweat was like drops of blood falling on the ground. The medical term for this, “hemohidrosis” has been seen in patients who have experienced extreme stress or shock to their systems. The capillaries around the sweat pores become fragile and leak blood into the sweat. The fully human Jesus knelt in prayer and anguished over what lay ahead of Him. The fully human Jesus would know every excruciating lash of the whip and the piercing pain of the crown of thorns. This Jesus in the Garden of Gethsemane was fully God and fully human. We may not understand how this is possible but to appreciate the magnitude of what Jesus did, we need to accept it. On Friday, Jesus would appear before Caiaphas, the high priest, then before the entire Sanhedrin (the highest judicial and ecclesiastical council of the ancient Jewish nation composed of around 70 members). Then He would be before Pilate, Herod and Pilate again. Judas, filled with remorse and self-loathing over his betrayal of Jesus, would commit suicide. Pontius Pilate, responding to the cries of the crowd to crucify Jesus, approved the death sentence and then tried to wash his hands of the whole affair. But before sending Him off to be crucified, Pontius Pilate had Jesus scourged. In this form of punishment, the prisoner was tied to a post with his back bent and a whip with long leather thongs studded with sharp pieces of bone, rocks, lead pellets and glass was used. With each lash, the whip would wrap around the body, stripping off pieces of flesh. Roman beatings could be so severe that bones and organs were left exposed. By the time they got through beating Him, Jesus’ body may well have been barely recognizable. The pain from being struck with this instrument – up to 39 times from the neck to the knees — was so severe that men died under it or broke with loss of their senses. But Jesus retained His consciousness throughout. They spat on Him and took the staff and struck Him again and again on the head and then they led Him away to be crucified. John tells us that Jesus – battered, whipped, dehydrated, exhausted from a sleepless night — carried His own cross as they headed out of Jerusalem. But, with His condition weakened by the torture, Jesus stumbled under the load. And the soldiers took a man – a North African — from the crowd – Simon of Cyrene – and ordered him to carry Jesus’ cross. Jesus followed until the 650 yard journey from the fortress of Antonia to the place of crucifixion was completed. 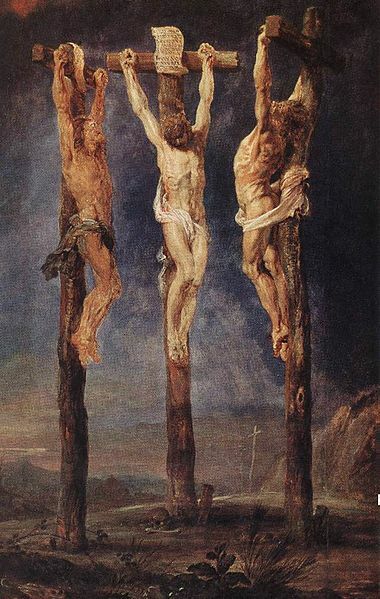 The Three Crosses by Peter Paul Rubens (c. 1620). Jesus was crucified at about nine o’clock in the morning. Our passage from Matthew refers to the sixth to the ninth hours (which, in our reckoning would be from noon to 3 o’clock) and in those three hours darkness came over the land. As evening approached, Joseph of Arimathea, accompanied by Nicodemus – we’re told by the gospel writer John — dared to go to Pilate to ask for the body of Jesus. And this is where we find ourselves in this Holy Week. This week, if you dip your bread into oil or eat an olive, think as you do of Jesus pouring Himself out in grief on the Mount of Olives – in Gethsemane – the oil press — as He looked toward the cross. As you look upon the palm branch you may have received in worship, give thanks to the One who went to the cross for you and praise Him – our Prophet, Priest and King, our Savior, our Lord. If you pass a field where donkeys are grazing, think of the Man of Peace riding triumphantly into Jerusalem. Wherever you are, imagine yourself in the crowd, laying your tributes at His feet. Place yourself at the Last Supper, in the Garden of Gethsemane, listen to His teaching, walk with Him through these days. Note: I’ve compiled and composed this piece from notes collected over the years…I pray I’ve given appropriate attribution. I appreciated your use of “Saving Private Ryan” in your blog piece as it aptly illustrates our inability to “earn” our way to salvation. You rightly note that “instead of stumbling on the cross because you insist on trying to earn God’s favor, [we must] bow at the cross and receive his gift.” Amen!